Ede (Holanda). Culturfondns donates the Ripollés great sculpture in bronze TUMBADO to the city of Ede, in Holland. Paris (Francia). New Urban Art Fair edition presents Ripollés by Galerie Ange Basso. Kaohsiung (Taiwan). The One Gallery exhibits Ripollés material etchings and resin sculptures. Kerkrade (Holanda). The eleven-meter hight VIVA LA VIDA sculpture opens on July 27 in the Dutch city of Kerkrade, coinciding with the WMC International Music Competition. Taipe (Taiwan). 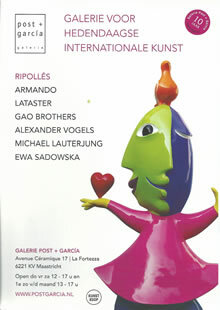 Opens in Citylink Mall, by Lasertek, a great exhibition of Ripollés paintings and sculptures. Paris (Francia). Urban Art Fair presents Ripollés Artworks, by Galerie Ange Basso. Rotterdam (Holanda). Rottterdam Contemporary fair presents Ripollés works, by Galerie Post + Garcia. Maastrich (Netherlands). Post-Garcia Gallery. Exhibition of recent works, paintings and sculptures. Lille (France). Contemporary Art Fair. Paintings and sculptures with Galerie Ange Basso. Chicago (Estados Unidos). Feria Sofa ,con galería Berengo Studio. Neuchâtel (Suiza). Colección de joyas con Artswissr. Kaohsiung (Taiwan). Exposicion individual. Pintura, escultura y grabado en la Galeria Yi Yuan Ho. Lille (Francia). Feria ART-TUP de arte contemporáneo, con Galería Ange Basso. Breda (Netherlands). Art Breda Fair exhibition with Post + García Gallery. Kaohsiung (Taiwan). 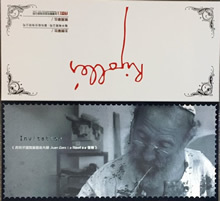 Retrospective exhibition at the Ho Yi Yuan Gallery. Knokke (Bégica). Gallery Art-Up. Paintings, sculptures and etchings. París (Francia). Art Elysees.Galerie Ange Basso. Lille (Francia). 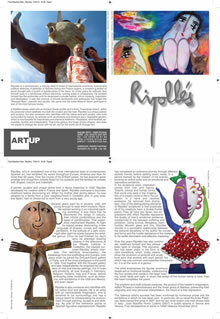 Artup Foire d’ Art Contemporani, with Ange Basso Gallery. Laussanne (Suiza). Art&Emotion Gallery. Sculptures and canvas exhibition. Maastrich (Holanda). Galerie Post- Garcia. Groupal Exhibition. Maastrich (Holland). Art Space. Bronze sculptures Exhibition. Breda (Holland). Art Breda Fair, with Tom Okker Gallery. Hasset (Belgica). Desserts Gallery. Groupal Exhibition. Moffat Beach, Queensland (Australia). Holloway Galery. Etchings and Murano crystal sculptures. Castellón (España). Ripollés designs the scenography of Mozart’s 'Magic Flute'. Alcira (España). Cultural Center. Etchings, canvas and sculptures Exhibition. Lille (France). Artup Contemporary Art Fair, with Ange Basso Gallery. Cieza (Murcia). Efe Serrano Gallery. Exhibition of paintings, sculptures and prints. Paris (France). "Une vie en colors", in Ange Basso Art Gallery. Singapore (Singapore). 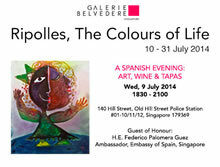 "The colors of life", in Belvedere Art Gallery. Tai’an, Shangong Province (China). Tai’an City Hall, exhibition of large-format sculptures, paintings, etchings, iron, bronze, fibreglass and resin sculptures. Maastricht (Holland). Post-Garcia Gallery. Joint exhibition of paintings, sculptures and etchings. Valence (France). Chromalies. Exhibition of sculptures. Lausanne (Switzerland). Art& Emotion Gallery. Exhibition of paintings, sculptures and etchings. Knokke (Belgium). Art-Up Gallery. Exhibition of paintings, sculptures and etchings. Spa (Belgium). Azur Gallery. Paintings, sculptures and etchings. Veldhoven (Netherlands). Hans Persoon Gallery. Exhibition of paintings, prints and sculptures. Gouda (Netherlands). Arti Legi Cultural Space. 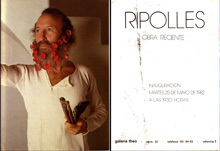 Retrospective exhibition. Chicago (USA). 20th Sofa Art Fair edition, with Berengo Studio Art Gallery. Liege (Belgium). Liehrman Gallery. Exhibition of paintings and sculptures. Geneva (Switzerland). Cigarini Gallery. Exhibition of paintings, sculptures and etchings. Escaldes-Engordany (Andorra). 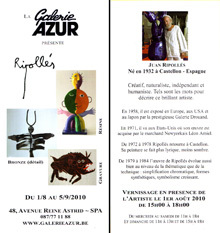 Exhibition of large-format sculptures “UNIVERS RIPOLLÉS”. Government of Andorra Exhibition Rooms. 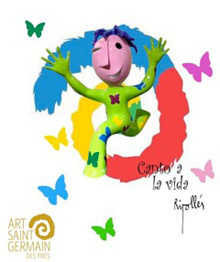 “Emoción Viva” (Living Emotion). Curator: Pilar Gimeno. Venice (Italy) Biennale. Totemcity. Scuola Grande de San Teodoro. Escaldes-Engordany (Andorra). Exhibition of paintings, etchings and sculptures in the Art al Set Gallery. Kars (Germany). Spanish Art Gallery. Exhibition of paintings, sculptures and prints. Maastricht (Holland). Post-Garcia Gallery. Joint exhibition of works by Alechinsky-Lataster-Ripolles. Palm Beach (USA). Art Palm Beach Contemporary with Berengo Studio. Orense (Spain) Visol Gallery. 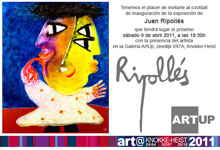 Joint exhibition entitled 'El Gato' (The Cat) with the matter etching by Ripollés. Chicago (USA) Sofa Chicago Art Fair with Berengo Studio. Geneva (Switzerland). Cigarini Gallery. Exhibition of paintings, etchings and sculptures. Venice (Italy). Joint sculpture exhibition on Berzosa Island as part of the official Biennale programme. Eindhoven (Holland). Contemporary Art Fair. Murano glass sculptures with the Berengo Studio. Valencia (Spain). Designs a poster for the First Congress of the Federation of Fallas. Aix-les-Bains (France). Grand Cercle Casino. Amsterdam (Holland). Kunst Rai ’04. Berengo Fine Arts. Murano-glass sculptures. Ghent (Belgium). Lineart Gent 2004. 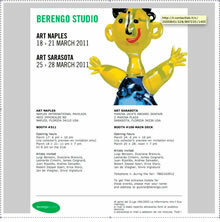 Artemas Gallery and Berengo Fine Arts. Castellon (Spain). Large-format sculptures. Sponsor: Paco Molina-Azahar. Maastricht (Holland). European Art Fair 04, Luis Elvira Gallery. Iron sculptures. Post-García Gallery. Paintings and sculptures. Hasselt (Belgium). Dessers Gallery. Paintings and sculptures. Amberes (Belgium). Antelope Gallery. Paintings and sculptures. Castellon (Spain). Creates the Nativity Scene for the façade of the Castellon Auditorium and Convention Centre. Innsbruck (Austria). Internationale Kunstmesse 2004 with the Pieter Post Gallery. The Hague (Holland). Holland Art Fair 2004 with Berengo Fine Arts. Castellon (Spain). 1st Prize for the Cadena SER Plastic Arts Awards. Innsbruck (Austria). Internationale Kunstmesse 2003. Pieter Post Gallery. The Hague (Holland). 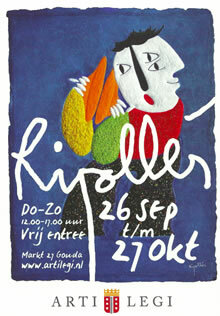 Holland Art Fair 2003. Pieter Post Gallery. Chiefs and Spirits Gallery. Santo Domingo (Dominican Republic). Travelling exhibition of latest large-format sculptures organised by the “Museum Consortium” of the Regional Government of Valencia. Trento (Italy). Trentini Palace. International Sculpture Exhibition. Amsterdam (Holland). Kunst Rai 03. Berengo Fine Arts. Murano-glass sculptures. Pan 03. Hüsstege Gallery. Paintings and sculptures. Oropesa (Spain). Iron Museum. Exhibition of matter etchings. Ghent (Belgium). Lineart Gent 03. Artemas Gallery - paintings and sculptures. Berengo Fine Arts. Murano-glass sculptures. Geneva (Switzerland). Cigarini Gallery. Paintings and sculptures. Castellon (Spain). Large-format fibreglass and bronze sculpture for the Castellon Provincial Hospital. ‘s-Hertogenbosch (Holland). Kunst Rai ’02. Hüsstege Gallery. Berengo Fine Arts. Ghent (Belgium). Lineart Ghent 2002 with the Artemas Gallery. Lineart 2002, with Berengo Fine Arts. Valencia (Spain). “Homenaje al libro” (Homage to books). Twelve-tonne bronze sculpture commissioned by the Regional Government of Valencia for the square in front of the Valencia Library. Oropesa (Spain). Iron Museum. Exhibition of recent iron sculptures. Amsterdam (Holland). Art Works Gallery. Paintings and sculptures. Kunst Rai 2002 with the Hüsstege Gallery and Berengo Fine Arts. Leon (Spain). 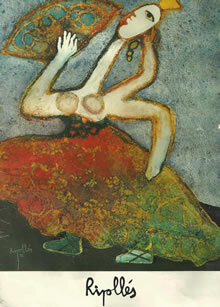 Sardon Gallery - paintings, etchings and sculptures. Castellon (Spain). Bronze and fibreglass sculpture-fountain “Homenaje al filador y Menaor”, entitled Les Cordeliers. Fourteen metres tall with a sixteen metre diameter commissioned by Castellon City Hall. Castellon (Spain). Large-format sculptures for Castellon Port as part of its 75th anniversary celebrations. Ostend (Belgium). Presentation of Murano-glass sculptures. Lido (Italy). OPEN 2001. 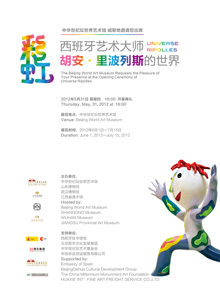 4th International Sculpture and Installation Exhibition. Sponsor: Berengo Fine Art Gallery and Azahar. Murano (Italy). Travelling Murano-glass sculpture exhibition funded through the European Parliament. Valencia (Spain). 1st Prize for the Valencia Regional Government’s Plastic Arts Award. Soria (Spain). Historic Centre. Fourteen large-format, open-air sculptures. Sponsor: Azahar. Organised by Soria City Hall. Ibiza (Spain). International Gallery. Paintings and sculptures. Calpe (Spain). Calpe Cultural Centre. 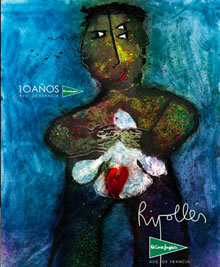 Exhibition entitled “Entre dos Milenios” (Between two Millenniums). Amsterdam (Holland). Kunst Rai 2001 with the Hüsstegge Gallery. Cologne (Germany). Kunst Köln 2000-Fischerplatz Gallery. ’s-Hertogenbosch (Holland). Exhibition of large-format sculptures organized by the Hüsstege Gallery. Valencia (Spain). Almudin Palace. Exhibition of the latest large-format sculptures. Organized by the “Museum Consortium” of the Regional Government of Valencia. 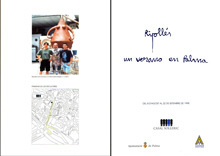 Travelling exhibition through the Valencia Region and then on to South and Central America. Ghent (Belgium). Linearte Ghent 2000 with the La Aurora Gallery. Ulm (Germany). Fischerplatz Gallery. Paintings and sculptures. München (Germany). Prannerstrasse Gallery. Etchings. Singapore. Singapore Arts Festival ’99. Salou (Spain). Sculpture Walk: Fourteen large-format sculptures in the open air. Alicante (Spain). Alicante University Museum exhibition entitled “La Memoria Que Nos Une” (The memory that unites us). ‘s-Hertongenbosch (Holland). Hüsstege Gallery. Joint exhibition. Amsterdam (Holland). Kunst Rai ‘99 with the Hüsstege Gallery. Villarreal (Spain). Villareal City Museum. Joint exhibition. Iron sculptures. Vall d´Alba (Spain). Bronze statues measuring 123x300x137cm and weighing 600kg. Bremen (Germany). Kühn Gallery. Paintings and sculptures. Marbella (Spain). José Palomo Exhibition Rooms. Paintings and sculptures. Palma de Mallorca (Spain). Casal Solleric. Paintings and sculptures. Paseo del Born. Fourteen large-format sculptures in the open air. Sponsor: Azahar. Dusseldorf (Germany). Art – Multiple ‘98. Fischerplatz Gallery. Matter etchings, bronzes and resins. ‘s-Hertongenbosch (Holland). Hüsstege Gallery joint exhibition. Amsterdam (Holland). Art Works. Paintings and sculptures. Villafames (Spain). Large-format, bronze sculptures. Amsterdam (Holland). PAN ‘98 with the Hüsstege Gallery. Paris (France). Dionne Gallery. Paintings and sculptures. ‘s-Hertogenbosch (Holland). Hüsstege Gallery. Paintings and sculptures. Berlín (Germany). Kühn Gallery. Etchings. Bordeaux (France). Imagine Gallery. Paintings and sculptures. Amsterdam (Holland). Pan ’97. Hüsstege Gallery. Lausanne (Switzerland). Catherine Niederhauser Gallery. Matter etchings. Dusseldorf (Germany). Art Multiple ‘97 with the Fischerplatz Gallery. Amsterdam (Holland). Pan ‘96 Hüsstege Gallery. Paintings and sculptures. Düsseldorf (Germany). Art-Multiple with the La Aurora and Dionea Galleries. Matter etchings and bronzes. Lausanne (Switzerland). Catherine Niederhauser Gallery – paintings, sculptures and etchings. Dortmund (Germany). Ante Gallery. Paintings and sculptures. Amsterdam (Holland). Art Works Gallery. Sculptures, etchings and paintings. Lausanne (Switzerland). Paul Valloton Gallery, Catherine Niederhauser Gallery and the Olympic Museum. New York (USA). Art-Expo ‘95. Dione Gallery. Paintings and sculptures. Amsterdam (Holland). Art-Works Gallery. Paintings, sculptures and etchings. Murcia (Spain). La Aurora Gallery. Paintings, sculptures and prints. Ghent (Belgium). Line-Art 95 with the Laimböck Gallery. Amsterdam (Holland). Art-Works Gallery-Biennale. Sculpture. Evian (France). Club Royal. Rostropovich Room. Exhibition of matter etchings. Dusseldorf (Germany). Art Multiple ‘94 with the Bosquet and Dione galleries. Chicago (USA). Kass Meridian Gallery. Paintings. Dusseldorf (Germany). Art Múltiple 93 Hüsstege Gallery. Matter etchings. Paris (France). 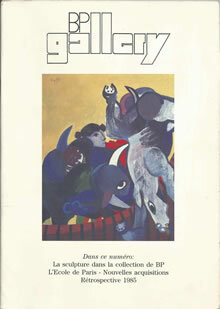 Saga 93 with the Dionne Gallery. Gandía (Spain). Gandia University. Exhibition of etchings. Meribel (France). Antares Hotel and the Banque Populare Savoisienne de Crédit. Amsterdam (Holland). Art Works Gallery Paintings and etchings. Miami (USA). Miami Art ’92, Convention Center (Art Deco District) with the Bosquet Gallery (paintings) and Kass Meridian Gallery in Chicago (matter etchings). Amsterdam (Holland). Art Works Gallery. Stockholm (Sweden). Art Fair ’91 Spanish Pavilion. Brides-les-Bains (France). Gallery at the Thermes Grand Hotel. Barcelona (Spain). Dube Gallery. Prints. Paris (France). Interart ‘92 with the Dionne Gallery. Paris (France). Fiac Edition with the Bosquet Gallery in Paris. Talavera de la Reina (Spain). Municipal Cultural Centre. 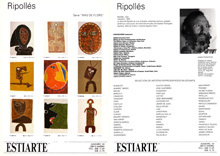 Joint exhibition of prints by Saura, Tapies, Chillida & Ripollés. Castellon (Spain). Nineteen metre tall, 42 tonne sculpture for the Castellon Planetarium. Paris (France). Saga ‘90 (Fiac Edition) Grand Palais. Stockholm (Sweden). Art-Fair with the Bosquet Gallery in Paris. Maastricht (Holland). Art-Fair ‘90. Hüsstege Gallery. Valencia (Spain). Viciana Art Gallery. Prints. Paris (France) Saga ‘89 (FIAC Edition) Grand Palais. 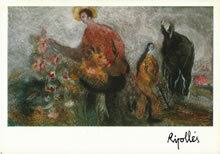 Presentation of matter etchings with the Estiarte Gallery in Madrid. Basel (Switzerland). Art’89 with the Estiarte Gallery. Salamanca-Valladolid-Avila-Zamora-Palencia (Spain). Travelling exhibition. Caja de Ahorros de Salamanca. Madrid (Spain). Estiarte Gallery. Prints. Granada (Spain). Madraza Palace. Exhibition of paintings. Amsterdam (Holland). Kooring Gallery. Iron sculptures. Granada (Spain). Madraza Palace and Granada University. Madrid (Spain). Conde Duque Cultural Centre. 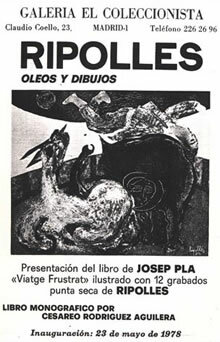 100 classic Spanish etchings. Valencia (Spain) Interarte ‘88 with the Val i 30 Gallery. Ghent (Belgium). Lineart ‘88 with the Val i 30 Gallery. Castellon (Spain). Commissioned by the Valencia Regional Government. A 50m2 ceramic mural in Borriol. Veere (Holland). Schotse Huizen Museum. Madrid (Spain). Estiarte Gallery. Classic etchings. Valencia (Spain). Theo Gallery. Classic etchings. Brussels, Amberes (Belgium) Europalia ‘85-Spain. 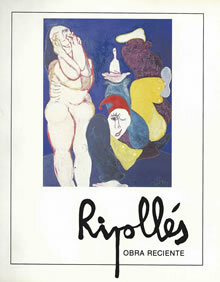 Ripollés is invited and sponsored by BP (British Petroleum) and exhibits at the “BP Gallery”. Bilbao (Spain). Ederti Gallery. Canvasses, etchings and drawings. Amberes (Holland). Europalia in BP Gallery. Madrid (Spain). Arco ’84 with the D’Eendt Gallery from Amsterdam. Eindhoven (Holland). Philips Foundation exhibition rooms. Valencia (Spain). Cuatro Gallery, Estudios Avanzados Foundation. Palma de Mallorca (Spain). Joaquin Mir Gallery. Middelburg (Holland). B. Witte Gallery. Castellon (Spain). Vermell Gallery. Etchings. Castellon (Spain). 200m2 mural along C/ Mayor no. 34 in Castellon. 400m2 mural in the Plaza de la Paz, also in Castellon. Tarragona (Spain). Arimany Art Gallery. Gijón (Spain). Tioda Art Gallery. Alicante (Spain). “Mediterránea” Visual Art Centre. Castellon (Spain). Simultaneous exhibitions at the Terra, Canem and Vermell Gallery and the El Campanar Gallery. Logroño (Spain) West Room of the former tobacco factory (Tabacalera). Valencia (Spain). Valle Orti Gallery. Madrid (Spain). El Coleccionista Gallery. Mexico City (Mexico). Miranda Gallery. Barcelona (Spain). La Pinacoteca. Paintings. Madrid (Spain). Anne Barchet Art Gallery. New York (USA). Leon Amiel Gallery. Seville (Spain). La Pasarela Art Gallery. Madrid (Spain). Don Quixote. Exhibition of figures and landscapes of Andalusia. Joint exhibition at associate galleries in Europe, the United States and Japan of the “Drouand David” Gallery in Paris. Seville (Spain). Pasarela Gallery. Paintings. Paris (France). Epona Gallery. Joint exhibition. Barcelona (Spain). Barcelona Contemporary Art Museum. Castellon (Spain) Castellon Savings Bank. Nievre (France). Art collector Albert Achdjian commissioned him to paint 12 works of art for the “St. Paul de Tigran de Chaulgnes” Church in Nievre. Paris (France). Part of a group of painters exhibiting at the Drouand David Gallery in Paris.